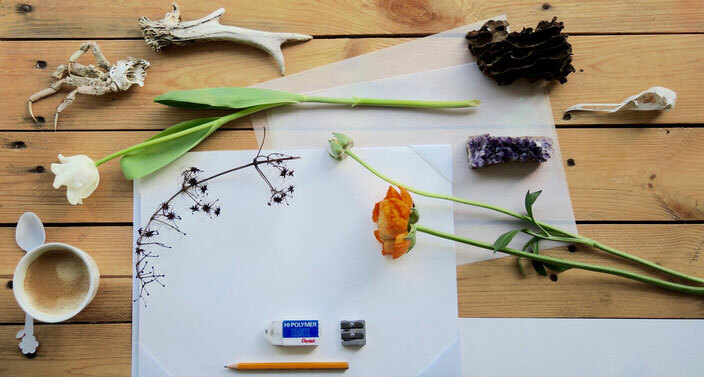 During the course “Drawing nature” you will learn to draw objects found in nature - flowers, leaves, feathers, minerals, insects, skulls, etc. and develop your own ideas and signature. During the last 4 classes you can choose among different programmes depending on your skills, interests and goals: (a) general drawing skills (b) shading/hatching/texture (c) colour (d) mixed-media (pencils, graphite, ink, fineliner, ballpoint pens, watercolour) (e) composition. Both for the beginner and the experienced learner. You can choose to work on a personal project after the course has finished. We discuss your ideas and you get advise on which materials and techniques would be most suitable to express your fascinations. You work at the atelier (same day and time of previous classes) and receive feedback and assistance to realise your goals. Of course you can use these classes to just continue working on your general drawing skills. Take a friend to the course and pay both 170,- EUR pp instead of 175,- pp! 3 classes of 2 hrs – 65,- EUR, optional after concluding the 8-lesson course. Missed classes: It is possible to catch up with max. 2 missed classes. Please refer to the terms and conditions for more information. There is room for 4 to 8 participants. Please read the terms and conditions before enrolling in a course. Enrolment for the trial class will take place in order of registration. Once one class is full you will be automatically placed in the following one. You will of course be notified of the time slot in which you have been placed.